Complimentary downtown Dadeland garage parking when you dine with us. Sunday to Thursday: 11:30 A.M. – 10:00 P.M.
Friday to Saturday: 11:30 A.M. – 11:00 P.M. Happy Hour Monday to Friday: 4:00 – 7:00 P.M.
At each location, you'll find your favorite Genuine menu items, with slight variations. We'll integrate local flavors and ingredients, making sure each restaurant reflects its neighborhood. 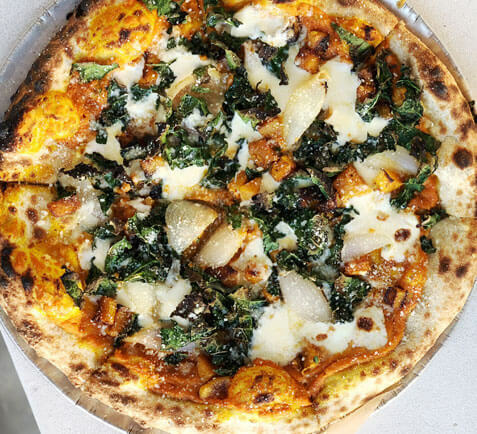 Our new seasonal pizza ($14) is flavor-packed with pumpkin purée, roasted pumpkin & cipollini onions, kale, and a blend of auribela & mozzarella cheeses. Bundle up with bacon for $2 more! Available at all locations.